The Theater Royal deeply regrets the death of Montserrat Caballé, undoubtedly one of the greatest sopranos of all time, to which he dedicated function Faust tonight as a symbolic tribute to his greatness. The amazing career of Montserrat Caballe is one of the brightest in the history of the universal lyrical interpretation. The singular beauty of her voice, large extension, the rich color palette of timbre, his prodigious technique, the expressiveness of its refined singing line, the incredible dramatic plasticity of their vocal performances, Allied to his desire to explore unknown or forgotten works, They have placed his name in the exclusive gallery of the greatest singers of the second half of the twentieth century. The last major Gala tribute to Montserrat Caballe It took place at the Teatro Real 9 December 2014, in which recognized related sopranos, somehow, with singer famous Barcelona, They played pieces will remember his triumphs in Madrid and its incomparable interpretations of romantic bel canto repertoire. Montserrat Caballé is a great landmark in the history of the Royal Theater since its concert hall, with memorable performances by composers such as Vivaldi, Granados or Bellini. In this last stage of the Real, after reopening, Montserrat Caballe has offered a concert 2 July 1998 and it has starred in two performances of the opera Cleopatra, Jules Massenet, in concert, in December 2004. After its first steps, in the years 50, at Teatre Fortuny Reus, his performances in the company of Municipal Theater Basel between 1956 Y 1960, and the contract with the Bremen Opera from that year, the dazzling Montserrat Caballé international career took off in New York, when in 1965 He replaced Marilyn Horne in the title role of Lucrecia Borgia, Donizetti, at Carnegie Hall. After the first aria the audience gave her a standing ovation twenty minutes at the end of the function began his meteoric career by leading opera houses of Europe and America: La Scala in Milan, Metropolitan New York, Staatsoper de Viena, Royal Opera House de Londres, Paris Opera, Liceu Barcelona, Teatro de la Zarzuela in Madrid, Moscow Bolshoi, Teatro Colon in Buenos Aires, San Francisco operas, Hamburg and Munich, etc., and Salzburg festivals, Aix en Provence, Orange, Glyndebourne, Pesaro and Verona. Montserrat Caballé's repertoire is immense. With about 90 different operatic roles, It is unrivaled in its tessitura, in the world of opera. His record is equally wordy catalog, more than 80 Titles, half of which are complete operas. Before its international hatching, Caballé played different roles in the theaters of Basel and Bremen, from the heroines of Verdi and Puccini to Arabella O Salomé, Richard Strauss. Over the years his career was forming around a small list of composers whose repertoire deepened and refined to achieve their indelible performances of Gioachino Rossini, Luigi Cherubini, Vicenzo Bellini, Gaetano Donizetti, Giuseppe Verdi, Giacomo Puccini, Blom or Jules Massenet. He debuted in Madrid in 1967 with La traviata Y Manon, the latter sharing the stage with Alfredo Kraus. later would come, at the Teatro de la Zarzuela, interpretations of many of his greatest roles: Elisabetta (from Robert Devereux), Cio-Cio-San, Rule, Adriana Lecouvreur, Maria Stuarda, Leonora, Semiramide, Ermione, Maddalena (from Andrea Chénier), Silvana (from The flame, de Ottorino Respighi), Elisabetta (from Don Carlo) or queen protagonist Sancia, Donizetti, one of the composers who dedicated a devout attention as an interpreter, research and publishing. The public of Madrid has also witnessed his rare and exciting forays into the Germanic repertoire, giving life to Salome, Richard Strauss, or Isolde and Sieglinde, Richard Wagner. As a soloist he has performed with the greatest orchestras and the most renowned directors of the second half of the last century, como Herbert von Karajan, Leonard Bernstein, Carlos Kleiber, Sir John Barbirolli, Zubin Mehta, James Levine, Claudio Abbado, Seiji Ozawa, Riccardo Muti, Sir Georg Solti, Sir Colin Davis, Carlo Maria Giulini, etc. 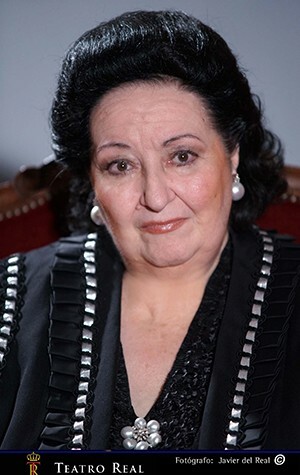 In addition to its excellence as an interpreter, Montserrat Caballe has done meticulous research and enthusiastic lyrical repertoire almost forgotten or unknown, as Armide Gluck, the Danaides the Salieri, Sappho Pacini, La Vestale Y Agnese in Hohenstaufen of Spontini, Herodias Massenet, Medea and Demophon de Cherubini, Ermione e The trip to Reims Rossini, Sancia Donizetti and The flame the Respighi. Some of these titles are now common in operatic stages thanks to his curiosity and his pioneering work as disseminator of new scores. It is also known penchant for studying the works with facsimile editions, to appreciate all the notes of the composer. In addition to its vast repertoire of classical music domain, Montserrat Caballe's curiosity led him to explore other types of sound universes, hand of some important artists like Freddie Mercury or Vangelis. Caballé was recognized with numerous awards and decorations, including the Order of Isabella the Catholic, Commander of Arts and Letters Francia, Academic Honor and Gold Medal of the Academy of Letters, Science and Arts of Italy. It was, since 1974, Goodwill Ambassador of the United Nations.